It’s not often that a 28-year-old pitcher with a 4.11 career xFIP goes untouched as a free agent. Yet that’s what Jeremy Bonderman experienced this winter. Some teams apparently showed interest, but not to the level that Bonderman apparently deemed acceptable. Even as spring training has begun and some teams have realized needs in the rotation, we haven’t seen Bonderman strongly connected to anyone. As it turns out, he’s thinking about sitting out the season. That seems like a shame for a relatively young pitcher who once showed so much promise. ESPN’s Jerry Crasnick broke the news earlier today, citing a player who knows Bonderman. He then elaborated, saying, “Bonderman apparently doesn’t have the energy for more rehabs, or going to camp and having to fight for a spot.” The rehabs thing is apparently preemptive, since he has no apparent injury from which to rehab. (Or does he?) The last bit is the interesting part. He doesn’t want to fight for a spot? That strikes me as a bit odd. This isn’t to say that Bonderman shouldn’t have to fight for a job. Considering his last four big league seasons, he absolutely has to prove that he can first stay healthy, and second consistently get out big league hitters. But he has been a successful pitcher in the past. It stands to reason, too, that he could fairly easily win a spot in the rotation of a second division team. Or, at least, that’s what I thought at first. After looking at some more data on Bonderman’s 2010, I’m starting to understand why he might want to lay low in 2011. Other than his bloated ERA , a few things stand out about Bonderman’s 2010 season. First is his diminished strikeout rate. When he peaked in 2006 he was striking out nearly a batter per inning. With injuries that started to fall, and during his comeback season he struck out just 5.89 per nine, more than a batter per nine lower than league average. His walk rate, once a major strength, crept towards league average. And his home run rate, which used to hover around league average, eclipsed it significantly. Since those are the components for FIP, it’s no wonder that his was 0.82 higher than league average. Yet that might not be the most disturbing aspect. 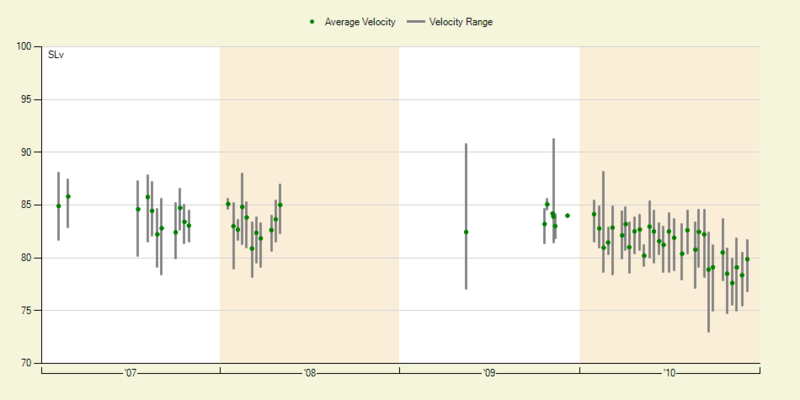 His slider velocity, too, fell at about the same time. These aren’t adjusted numbers, but the trend persists for long enough that it appears to be of concern. 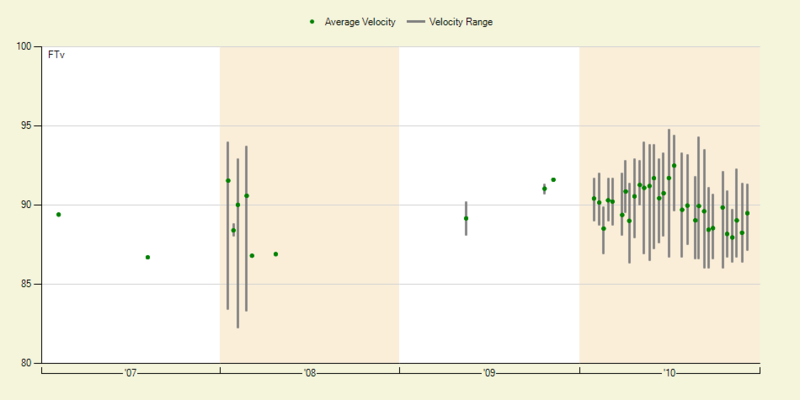 Not only was Bonderman’s fastball velocity down overall in 2010, but it fell later in the year. The results speak to this. In his final 13 starts, covering 73.1 innings (5.2 IP/start), he had a 6.50 ERA and 5.56 FIP. Strewn about were four good looking starts, but three of them were against the same team, the White Sox, and the other was against the Royals. In other words, if you’re looking for some optimism in his second half numbers, it’s that he managed to match up well against one team. That’s not particularly encouraging. We don’t often see prime-aged pitchers taking a year off, especially following a healthy season. But in Bonderman’s case there is plenty to be concerned about. He might be further removed from his injury, but he was two years out last year and saw his stuff decline as the season wore on. Maybe a full year of rest will do his body good. Otherwise, this represents a sad end for such a promising pitcher. We hoped you liked reading Taking a Year Off During His Prime by Joe Pawlikowski! Last July he admitted he was contemplating retirement so it shouldn’t come as much of a surprise to anyone. He seems to think it too much of a job and sounds like he doesn’t enjoy it anymore.